They touched the fringe of his cloak and they were healed. This seems too magical and easy. There is nothing more to it? No request. No conversation. No response. The mere faith to touch his hem suffices? Has it happened to you? You are dispirited, weighed down by the burden of the day. But a bare line of a hymn is on your lips before you know it. You give it voice and your day is lightened. It was the briefest brush with Christ. It was the hem of his garment. A verse of Scripture. A prayer. A smile across a room. The fringe of his cloak is nearly sacramental: the whole Christ comes to you in so small a wafer, so light a touch. He deliberately pairs small things with large effects, apparent insignificance with real consequence. He draws attention to mustard seeds, lilies, and the faith of children. The cross itself (“outside the gate,” Heb 13:12) happens at the fringe of the world. From there, saint by saint, the Church is stitched down the centuries to the hemline of the present — where you are the fringe of his cloak. 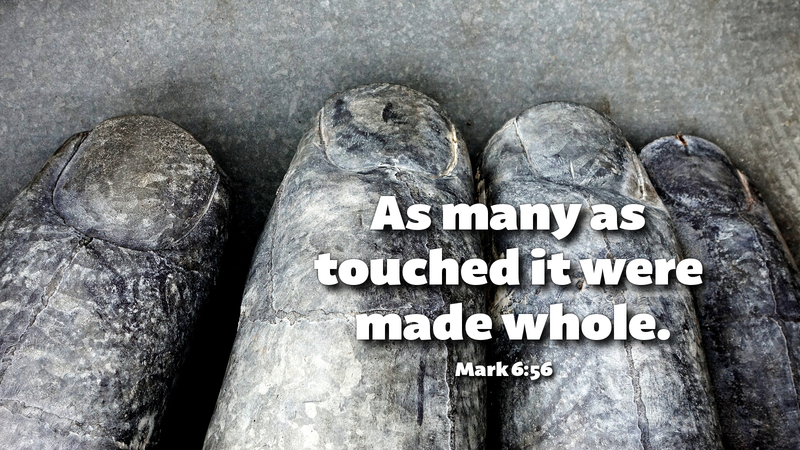 Prayer: Lord, may those who touch me touch you. Amen.